MUSLIM BROTHERS: “CUTTHROATS” OR HEROES? “We have not seen credible evidence that the Muslim Brotherhood has renounced its decades-long commitment to non-violence”. The US White House said these words last December 1st, in response to an online petition claiming the designation of the Islamic group as a terrorist organization. Nevertheless, Ḥamās Palestinian Islamist movement is still on the State Department list of foreign terrorist organizations. Next December 17th, the Court of Justice of the European Union has expunged Ḥamās from the list of terrorist groups. A month earlier, on November 15th, the United Arab Emirates had designated as terrorist organizations the Muslim Brotherhood, the al-Islah group, both Muslim American Society (MAS) and the Council on American-Islamic Relations (CAIR) US groups and other 79 movements, all sharing the same charge along with al-Qāʿida, an-Nuṣrah and Boko Haram. In Egypt, after the December 2013 Muslim Brothers’ ban, last August the Supreme Administrative Court had commanded the dissolution of al-Hurriyya al-ʿAdāla (Freedom and Justice) party, the Brotherhood political wing, and its assets and finances confiscation. Even earlier, on March 7th, Saudi Arabia had stated the already outlawed Muslim Brotherhood as a terrorist organization, by establishing stiff prison sentences for all Saudis who affiliate, fund, support or fight beside it, and by banning meetings of associated groups inside or outside of the Kingdom and online or media comments in favor of the organization. An international community? A schizophrenic community! Shared values? Quite national (or more often sectarian) interests, overseeing media mechanisms of propaganda. As always it happens when wars are underway. Or as it happens in the last few years when “peacekeeping operations” are ongoing! One of the victims of these hypocritical political maneuvering is precisely the Muslim Brotherhood, whose name would be preceded by “terrorist” or vice versa “heroic” adjective, according to conveniences of sects. And which we could connect to the “cutthroats of the Caliphate” or to the anchorites of Islamic piety, in accordance with the geo-political conveniences. Of course, none of these hypotheses! Nothing of what some secular-financial potentates manipulating their own media want us to believe. Especially in the “West”. Simply, Muslim Brotherhood, like it or not, fully enroll within that portion of political Islam which has decided to focus on the pairing Islam and Democracy, at least as low as nearly fifty years. Some European national governments about-face is surprising (most notably, Italy and its playful Prime Minister show a casual attitude on the matter). They, after having supported the so-called Arab Springs, today not only move away from, but even utter the words depicting any social conservatives of all time: “We were better off when we were worse off”. And thus, the putschist as-Sīsī, in spite of the much-vaunted democracy, becomes the hero of the day and even the reference for Quranic hermeneutics. Of course, the ‘”West” does not exist, either politically or culturally. And so it happens that some Western media (such as The Economist and The New York Times) say loud and clear some Western democracies have supported the overthrow of freely elected Islamists governments, and those democracies welcome the introduction of anti-democratic regimes, yes, but with the asset of secularism. Therefore, appreciation not for democracy, but for secularism. It’s the Franco-Jacobin way: many sincere Anglo-Saxon-inspired liberals turn up their noses for this, denouncing the European drift with respect to those tolerance principles just the “head cutters” of the French Revolution had betrayed immediately after its victory and their emulators perpetuate in current events as their version of freedom concepts. Yes, because the hasty closeout of the political Islam democratic experience, albeit imperfect, has paved the way for all those extremist tendencies just waiting to show the implementation of Islamic principles can only be through violence. Actually, on a historical level, the “Easterners” (maybe so we ought to call them) have been learning from the “Westerners” for nearly a century that an axiomatically deemed right idea requires violence in order to triumph. It has been so since a military glorification resulted from the mystical of the two infamous World Wars has made havoc of the Islamic world, making it subject to cynical geo-political and ideological logics of power, both of them external factors with respect to its way of living and thinking. 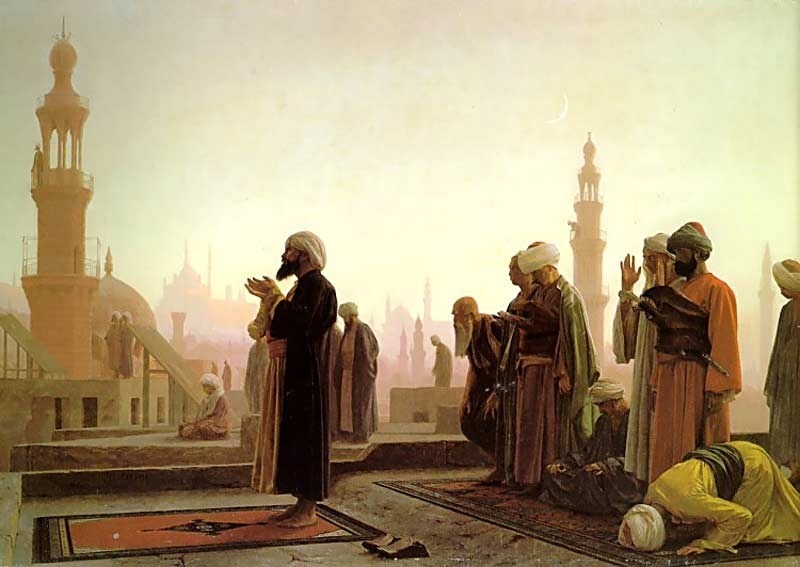 Against this background of experiences, many Muslims (the majority) had decided to close the ranks behind an idea of recovering their identity, while respecting the rules of civil coexistence, concerning (these of course!) the international community; and in so doing, they were aligned to the standards of the so called “Western civilization”. This was and is the path indicated by the Muslim Brotherhood. Faced with the betrayal of the worst part of this exogenous alleged civilization, more and more Muslims than before are willing to provide some sort of solidarity with the Islamic State and with al-Qāʿida, an-Nuṣrah and Boko Haram. Who should now cry mea culpa? Sure, some European Chanceries (and especially their related public opinions) think they have ousted the Muslim Brotherhood from political landscape, only as a result of the liberticidal rules currently governing relationships between the Egyptian regime and its own people. This inaccuracy is a fruit of knowledge lack about phenomena shaping political Islam, and the Muslim Brotherhood in particular. Several sources reveal an articulated international structure of its organization, despite denials of many of its branches are driven by the need to avoid penalties that repressive laws of some countries provide against them. However, the countries recording their presence would be 60, including almost all Arab countries, the United States and many of those in Europe, though we have to register a claim of organizational autonomy from the hierarchical system of their headquarters, and although in the framework of a substantial identity of cultural references. Therefore, there’s a connection of thought and a work of intellectual influences, more than a tie of political action. This should mostly worry their detractors, because you may temporarily overcome a presence on the ground by violence, you cannot defeat an idea, yet. Also because the Brotherhood roots in the land rely on social (rather than political) action, which is a true successful element and a factor of popular appreciation. Moreover, history tells us the Muslim Brothers’ internationalization has been consolidated just as a result of the brutal secularist repression against them committed by Nasser in the 50’s and 60’s, and culminated in the Sayyid Qutb’s hanging in 1966. Following such a crucial event, the Muslim Brothers would have clearly distanced from the armed struggle ideology and would have moved to a moderation based on tolerance and market economy, unlike other Egyptian groups such as Takfir wal-Hijrā, al-Jihād, Jamā‘a Islāmiyya, and others. Before these events, the Brotherhood had tried to expand its presence outside Egypt, and in particular towards Palestine, Jordan, Syria and Iraq, and then to the Maghreb and other areas of the Middle East, on the basis of an anti-neo-colonial protest. Its roots in Europe and the United States, set up in the 60’s, show an obvious flexibility in the strategy of thematic priorities: while in Egypt, Middle East and Maghreb human rights, political freedoms and social conditions have preeminence in seeking a consensus actually putting it as an alternative to secular authoritarian regimes of the area, in the West it comes to merely strive for a recognition of a cultural presence by institutions and civil society, which does not seem obvious, as it’s still today evident. 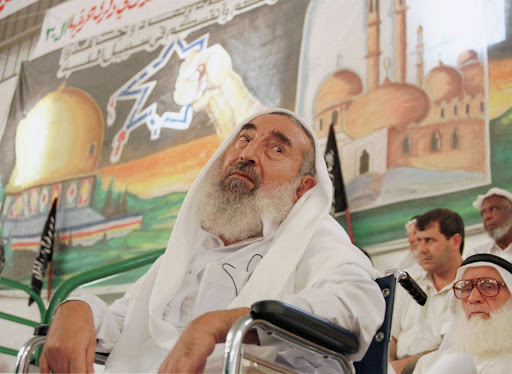 Even a different glance is in Gaza, where Ḥamās was founded in 1987 in the light of the thrust of a struggle against foreign occupation, which characterizes it as a liberation movement; the prospects breakthrough began to take shape in 2004, following the terrorist assassination of paraplegic Shaykh Aḥmad Ismā’īl Yāsīn (photo above) (by the way, nous sommes tous Ahmad), one of Ḥamās founders, when the movement started to be structured as a political organization. Ḥamās would have later marked Muslim Brotherhood first democratic success, by winning parliamentary elections in Palestine in 2006, and gaining almost 60% of the seats in the Palestinian Legislative Council; of course, the unexpected electoral outcome would have angered that Jacobinism ever present in the “democratic” countries (Israel, the United States, Europe), which, in its radical extremism, has no convenience for democratization of the political forces and of the area in general, and thus plays out its best weapons: a coup and the civil war. As well as years later in Morsi’s Egypt! And in full continuity with the maximalist inspirations of “Robespierre-style democracy”! Even earlier, the issue of Islamists’ democratic option had raised great attention since the 80’s, in Tunisia with Ghannouchi’s initiatives and Ḥizb an-Nahḍa establishment (which is not a Muslim Brothers’ sonship, but was inspired to them since its origins), and in the early 90’s in Algeria. The subsequent coup in Algiers and the brutality of following repression have for the first time aborted the democratic initiative, not only of the Islamic Salvation Front, but also of the reform-oriented and moderate Islamists and of the Muslim Brothers such as Djaballah Guetaf, Younsi and Nahnah. Even the Muslim Brothers would not be involved in the wave of political violence that would have given rise to so many armed movements until the formation of the Salafist Group for Preaching and Combat. And the very onset of al-Qāʿida in the Land of the Islamic Maghreb is to be largely charged to the aftermath of democracy denial in Algeria. Then, with the institutional openings to democracy, Muslim Brotherhood-inspired parties and groups designed for electoral processes arose: al-Islah in Yemen (since 1990), Justice and Development Party in Morocco (since 1998), Tawassoul in Mauritania (since 2007), Freedom and Justice in Egypt (since 2011), Justice and Development Party in Libya (since 2012), Mouvement pour le Développement et la Liberté in Djibouti (again since 2012). Some of them, as in Gaza, Morocco and Egypt, acquired consensus and later conquered institutional power by the motto Islam and Democracy, at least until political experiment has been stopped by the aforementioned antidemocratic processes put in place in Gaza and Egypt. The Brotherhood, deemed to have a million members, is labeled as a terrorist organization and all its members have been banned from participating in elections or political activities. It has been devastated by one of the harshest crackdowns in its history: a campaign of imprisonments and bans has targeted its affiliated organizations and main leaders, including its discreet Murshid al-‘am (General Guide) Muḥammad Badi‘ and freely elected President Morsi (photo to the side), who are on trial and may suffer the death penalty. The Freedom and Justice Party, which has won almost every election since the 2011 uprising had overthrown the autocratic President and former Army General Hosnī Mubārak, has raised formal objection to Cairo Appeal Court for Urgent Matters against its assets dissolution and liquidation. Maḥmud Abū ʿl-Enein, a Legal Affairs Committee member of the party, said the ban “contradicts Egyptian law”, and Human Rights Watch stated the measures taken by the Egyptian government to tag the Muslim Brotherhood as a “terrorist” group were politically driven and “aimed at expanding the clampdown on Brotherhood peaceful activities”. The National Alliance Supporting Legitimacy, founded in 2013 as the main Islamist coalition backed by the Muslim Brotherhood, has continued to hold protests since the military coup, and last January 25th, during demonstrations for the Revolution fourth anniversary, it had at least 15 dead and 35 injured people in its ranks. The centrist party Miṣr al-Qawwiyya (Strong Egypt) of doctor ʿAbdel-Munʿim Abū’l-Futūḥ said last May public boycott of the elections has questioned media claims that public opinion has united on recent political developments in Egypt. The Brotherhood presence is represented by Ḥamās, an acronym for Ḥarakat al-Muqāwwama al-Islāmiyya (Islamic Resistance Movement). ‘Izz ad-Dīn al-Qassām Brigades, its military wing, were cited in the original list the Council of the European Union established in December 2001 to freeze the funds of terrorist organizations. Its political wing had been added two years later. Ḥamās had challenged the decision and recently the Court of Justice of the European Union has found this had been “based not on acts examined and confirmed in decisions of competent authorities, but on factual imputations derived from the press and the internet”. Palestinian Prime Minister in office Rāmī Ḥamdallāh is today a result of Ḥamās consent to have a national unity government with authority both on the West Bank and Gaza Strip for the first time in seven years. Indeed, Ḥamās praised the “government of national consensus, representing all the Palestinian people”, and in Gaza its leader Ismā’īl Haniyeh, who legitimately claimed the post of Prime Minister of Palestinian National Authority following his February16th 2006 appointment, has equally praised the “historic” move of the establishment of Ḥamdallāh’s government. Israeli Prime Minister Binyamin Netanyahu had left peace talks with Abū Mazen, after in late April last year the latter had announced his intention to form a national unity government, and the former has repeatedly asserted that Israel would have not cooperated with a Palestinian leadership that includes Ḥamās, regarded as a terrorist group. The mid-March 2014 meeting in Dōḥa between Khālid Masha’l, Head of the Ḥamās Political Bureau, and Ramaḍān Shallāḥ, Secretary General of the Islamic Jihād Movement in Palestine, has highlighted an ongoing change in the Middle Eastern geo-politics: in October 2013 Ḥamās had indeed removed its long-term support to the Sunni insurgency in Syria. It has since softened its intransigent positions towards Damascus and has strengthened ties with the Ḥizb Allāh Shiite Lebanese movement, while, in parallel, has bridged the historical differences with the Islamic Jihād Movement in Palestine, all along steady Tehrān ally in the area. Ḥamās, initially neutral, had to take a stance in favor of Sunni insurgents fighting the Syrian `Alawites, especially in the wake of public opinion in Palestine, and had closed its headquarters in Damascus, which had replaced in 2001 the Amman’s after the expulsion from Jordan in 1999. On the other hand, the Shiite influence of Tehrān on Ḥamās had effectively never overflowed the religious, ideological and cultural levels, by observing a full respect for Sunni identity of the movement, and especially of its basis in Palestine. Thus, Ḥamās, as a Muslim Brotherhood offshoot, has avoided emphasizing any doctrinal and dogmatic disputes, not only for obvious reasons of political expediency, but also in accordance with the principles of Sunnis-Shiites rapprochement and of Muslims solidarity inspiring the Brotherhood, especially when Islam is under attack from forces external to its world. The Brotherhood, that settled in the Hāshemite Kingdom in 1945, has maintained a useful relationship with Monarchy (which considered it as a loyal opposition), especially under Ḥuseyn’s reign between 1953 and 1999. And even earlier, King ‘Abdallāh, who had recognized it in 1946 as a charitable association, had included its secretary ‘Abd al-Ḥākim ad-Dīn in the government. However, while keeping intact its institutional loyalty, sometimes the movement has openly expressed its opposition to the government policy, particularly in terms of foreign policy, as when it considered too soft the Hāshemite opposition to the separate peace treaty Egyptian President Anwār as-Sādāt had signed with Israel in 1979; or when, after the 1980 Iraqi invasion of Iran, it opposed the support of the Jordan to the Ṣaddām Ḥusayn’s Ba’athist socialist regime, because this decision would have resulted in an aggression to the only Islamist movement winning on a popular basis in the Muslim world, that is precisely the Āyatollāh’s. Since 1992, the Muslim Brotherhood political wing in Jordan has been the Islamic Action Front (Jabhat al-‘Amal al-Islami). The 1960 foundation of a mosque in Munich, Germany, marks the consolidation of an Islamic presence in Europe. Its mentor is Sa’īd Ramaḍān, son in law of the Muslim Brotherhood founder Ḥasan al-Bannā’ and previously his private secretary, who had settled in Geneva, Switzerland. Here he started attracting Muslim figures in Europe from the Middle East and created a refined cultural community. Since that time the Brothers, also through the action in Germany of men such as Muṣṭafā Mashhur and Muḥammad Mahdī ‘Ākif (later respectively fifth and seventh Guide General), would have settled in all EU countries and even in Russia and Turkey. Since 1989, hundreds of Islamic organizations of 28 European countries have combined to form the Federation of Islamic Organizations in Europe (FIOE) (its logo to the side), “based on moderation and balance, which represents the tolerance of Islam”. The Federation, established in Brussels, despite it deemed to belong to the Muslim Brotherhood, has denied conjectures, but confirmed there are good relations with it: “We are interlinked with a common point of view”. The same is true for two other associations born with FIOE support: the Forum of European Muslim Youth and Student Organizations (FEMYSO), established in 1996; and the European Council for Fatwa and Research (ECFR), a private foundation set up in 1997 in Dublin and chaired by the Egyptian theologian Yūsuf al-Qaraḍāwī. Its members, residing in Europe in a number not less than 75% by statute, address “the Muslim World and the Muslim minority in the West” in order to promote Sharī’a in everybody’s personal life, not to replace current legal systems with Sharī’a Law. The work of Swiss writer Tāriq Sa’īd Ramaḍān, a Ḥasan al-Bannā’s grandson, is fundamental to the debate on the Muslims’ future in Europe because of his clear call for Muslims integration into European society. the Iraqi Anas at-Tikriti’s Cordoba Foundation (TCF), an independent research and policy think tank, which since its 2005 founding has promoted “intercultural dialogue and coexistence among civilizations, ideas, cultures and people”, particularly between the Muslim World and the West. In 1963 some members of the Muslim Brotherhood and of the Jamā‘at-e-Islami theo-democratic movement gave life to the Muslim Students’ Association (MSA National) at the University of Illinois. In 1982 the Islamic Society of North America (ISNA) (its logo to the side), the largest family of Islamic organizations (now more than 4,000), was born in Indiana with the support of the Muslim Students’ Association among the founders. The year before, the Muslim Brotherhood had financed with seed money the creation of the International Institute of Islamic Thought (IIIT), a non-profit organization founded in Pennsylvania to realize some research projects, organize intellectual and cultural meetings, and publish scientific works. The Muslim American Society (MAS) and the Council on American-Islamic Relations (CAIR) were born in 1993 and 1994, respectively. Both groups are deemed affiliated to the Muslim Brotherhood and recently have been labeled as terrorist organizations by the United Arab Emirates, even though they have said do not wish to have any role in the Gulf state. The prior, established in Virginia, attended the meetings promoted over the years by the Committee on Ecumenical and Interreligious Affairs of the U.S. Conference of Catholic Bishops. The latter, based in Washington, D.C., is rated a high profile organization and has prominent American figures, such as politicians, interfaith leaders, journalists and media world producers, among its goers. The Muslim Brotherhood has been in Sudan since the Wahhābi theologian Ḥasan ‘Abdallāh et-Turabi, who would have been Chairman of Parliament during the 90’s, founded the Sudanese National Islamic Front in the 60’s. He headed the Front up to 1999, and left it, meanwhile renamed National Congress, when its leadership was conquered by General ‘Omar Ḥasan Aḥmad el-Bashir, current President of Sudan since October 1993. In Somalia the brethren refer to two political groupings: Harakat al-Islah (Reform Movement), an organization founded in 1978 by Sheykh Moḥamed Aḥmed Nur “Garyare”, whose goal is the establishment of an Islamic state, but affixing on it a brand of Islamic reform and revival to meet the challenges of the modern world. Despite the difficulty of political and institutional situation in Somalia, the movement confirms so far the democratic bases of its structure, even at internal level, by electing its Chairman in an Advisory Council, the Shura; Damul Jadid (Young Blood), a 2004 Islah offshoot, which today expresses the President of Somalia Ḥasan Sheykh Moḥamud and since March of last year has welcomed “Garyare” himself. In Mauritania the Muslim Brothers had inspired in 1974 the Jamā‘a al-Islāmiyya (Islamic Group) setting-up, the country first Islamic movement. 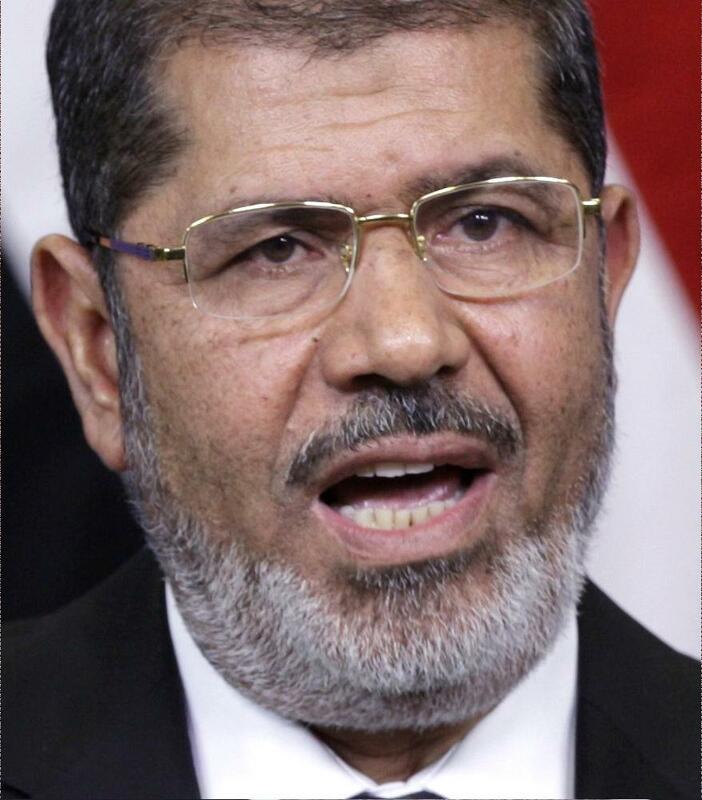 On August 3rd, 2007, the first two Islamist parties were allowed, including the National Rally for Reform and Development (informally Tawassoul, Intercession), inspired by the Muslim Brotherhood, and whose founder and President is Moḥammad Jemil Ould Manṣūr. After it entered the government in 2008 for the first time, Tawassoul has won 16 seats out of 146 of the National Assembly in December 2013 parliamentary elections. In Algeria there are two movements referring to the Muslim Brotherhood: Harakat an Nahḍa al-Islāmiyya (Islamic Renaissance Movement), established in 1989 by the reformist preacher Saad ‘Abd Allāh Djaballah Guetaf, who has been expelled from the movement in 1998 and today is President of the Justice and Development Front (commonly el-‘Adāla); and Harakat Mujtama’ as-Silm (Movement of Society for Peace), born in 1991 at the hands of Shaykh Mahfoud Nahnah as a remake of Harakat al-Mujtama’ al-Islāmī (Movement of the Islamic Society), founded a year earlier. The two movements oppose the current government and are very critical of the Algerian President ‘Abdelaziz Bouteflika. In Morocco Ḥizb al-‘Adāla wa’t-Tanmiyya (Justice and Development Party), inspired by the Muslim Brothers although officially declares no international affiliation, expresses the Prime Minister ‘Abdelillāh Benkirane, the Party leader since July 2008, following the victory achieved in November 2011 parliamentary elections, that granted the party 107 out of the 395 seats available. Even in the 2002 legislative elections the party had won 12.99% of the votes and 42 seats, and in 2007 it had finished second in the legislative elections, gaining 46 seats. Justice and Development, launched in 1998 by the surgeon ‘Abdelkrim el-Khatib, had straightway provided visibility to its presence, when it proposed a progressive annulment of bank interest, as deemed usurious; and it would have become more useful to the social achievements, by supporting in 2004 the approval of the new Family Code that enabled more rights to women. In Yemen the Muslim Brothers are active in Parliament through the Yemeni Congregation for Reform (known as al-Islah). Founded just after the birth of the new unified State by former mujāhid of the anti-Soviet war in Afghanistan Shaykh ’Abdul Majid az-Zindani, the group has been the strongest ally of President Hādī, and because of that, following the recent political events, its role is now downsized than before. In Saudi Arabia, as mentioned the top, the Muslim Brotherhood is not only prevented to form its own party (since parties are prohibited), but it has been declared a terrorist organization, as well. However, its ability to act on individual consciousness plays undoubtedly a work of cultural guidance: for example, there have been many entries of condemnation of the coup in Egypt, that Saudi Arabia has rather recognized and widely funded, and the ones disapproving the behavior of an-Nour Egyptian Salafist party, regarded as connected to the Saudis; or, again, many Saudi intellectuals (who while not adhering to the Muslim Brothers’ political stances) protested against the massacres prompted in Rābiʿa al-ʿAdawiyya by Sīsī. The new provisions against the Brotherhood have caused the reaction of its representatives: “It is one of the founding principles of the group not to interfere in matters of other States, and this new position from the Kingdom is a complete departure from the past relationship with the group, since the reign of the founding King until now”. And Amnesty International said Saudi authorities could use this law to suppress peaceful political dissent. This entry was posted on venerdì, Gennaio 30th, 2015 at 22:46 by admin	and is filed under Events by Area, Islamic Movements, Libya and Egypt, Maghreb, Middle East, Others, Sahel, Sub-saharan Africa. You can follow any responses to this entry through the RSS 2.0 feed. You can skip to the end and leave a response. Pinging is currently not allowed.